Robin Rothenberg is an internationally respected yoga therapist and author. She has been involved in several research studies on yoga therapy, and is the founder of the Essential Yoga Therapy training program. In this interview with YogaUOnline, she discusses ways to harness the healing power of breath in our yoga practice and in life. YogaUOnline: Right now you are immersed in an intensive study on the breath, inspired by a technique you have been researching for a few years now: The Buteyko Breathing Method . Tell us about the Buteyko technique and how you encountered it. He began to study the yoga texts and other traditions where breath has been a very critical part of the practice. Experimenting with himself, he was able to bring his high blood pressure significantly down by changing his breath. He then went on to use his breathing practice to work with asthmatics and people with COPD and breathing issues - with some quite remarkable results. He also noticed benefits for people with cardiovascular issues and chronic inflammatory issues like IBS, headaches and chronic fatigue. YogaUOnline: What’s the key principle of the Buteyko approach? Robin Rothenberg: Dr. Buteyko speculated that by manipulating the breath, you manipulate the gas exchange, ventilation-perfusion and balance between CO2 and O2. It is about retention of the breath, retention of Prana; it’s all in the Kumbhakas. By making the inhale and the exhale as small as possible and making the breath as quiet as possible, there’s less Prana moving out and more building of your Pranic vessel from the inside and filling it and utilizing it to its potential--a very yogic idea. YogaUOnline: You’ve incorporated the Buteyko Method into your own practice. What prompted you to learn about this technique and to start practicing it? Robin Rothenberg: Well, in the Fall of 2015 I caught a persistent and debilitating respiratory infection. After months of sleepless nights with incessant coughing, much to my surprise, I was diagnosed with having asthma! I recalled a student who had miraculous results with the Buteyko Breathing Method for her own asthma attacks. So I contacted her to learn more, and then went in and did a series of five sessions with her. And the results just kept building. Learning this breathing practice has been truly transformative. My chronic cough since childhood is gone. I have energy all day long, and if it starts to decline, I do my breathing practice and I am vibrant again. I think more clearly and more efficiently. From the yoga perspective, the Vrittis of the mind are very quiet; there is no constant buzz in the back of my head. I have also noticed positive effects on my digestion and a greater aerobic capacity than I’ve ever known. YogaUOnline: Is Buteyko Breathing something you do as part of a practice or is this something you do all day long? Robin Rothenberg: There is both a formal practice and informal practice. Dr. Buteyko and the Buteyko teachers prescribe a minimum of an hour a day formal practice. The informal practice is to be conscious of how you’re breathing all the rest of the time. I will explain in more detail in the webinar, but one tenet I will share now is to breathe through the nose and not the mouth. I was a great nose breather while I was on the mat, but I had never thought about it during the day. As a teacher, I do a lot of talking, and when I breathe in the middle of a sentence, I realized that I gasp for breath through my mouth the whole time; essentially it is a low level hyperventilation. There is an idea behind Buteyko that overbreathing is as much of a burden and disruption to our physiologic homeostasis and balance as overeating is. My informal practice is breathing through the nose 24-7, and I’ve had to re-teach myself how to speak. YogaUOnline: Have you been using this in your work with your yoga therapy clients and in your trainings? Robin Rothenberg: Absolutely. I went to Dublin for a weeklong intensive training with Patrick McEwan, a top Buteyko practitioner and teacher, and I just hosted him to do a practitioner training here for the people in my therapy training because they all want to learn how to do this and be able to operate in the full extent to their clients. Yoga U Online: You have a course on YogaUOnline on The Healing Power of Breath - Essential Techniques for Healthy Living in which you share some of the work you’re doing with the Buteyko practices. Tell us about the course. Robin Rothenberg: I am offering this course in the hopes that it will pique the curiosity and interest of the yoga teachers and practitioners who are participating. I believe it’s an important message to convey to yoga teachers that just like breathing too shallowly is a problem, overbreathing can be unhealthy for our system as well. There is an optimum amount of breath and an optimum rate of breath. In yoga, we slow the breath down, but we fail to address volume. We can slow the breath but if it’s a big breath in and a big breath out, we could still be hyperventilating. Buteyko is not moving away from yoga but actually dovetailing perfectly with it. The original teachings about breath in yogic texts such as Yoga Sutras and Hatha Yoga Pradipika and the Yoga Rahasya are congruent with everything I’ve learned from my Buteyko teachers. The contemporary transmission of Pranayama from my yoga tradition teachers has been the opposite. In the course, we will be visiting yogic texts on breathing and getting back to the original intention of the yoga masters who wrote about Pranayama and how Pranayama could be an empowering, transformative experience. The yogis knew that if we could control the volume and rate of our breathing, we could control our mental and physiological health. If we begin teaching yoga with the salubrious effects of breath reduction in mind, we can have a tremendous impact on people’s stress levels, health, and sense of well-being in a much more profound and lasting way. Interested in learning more about the healing power of breath? 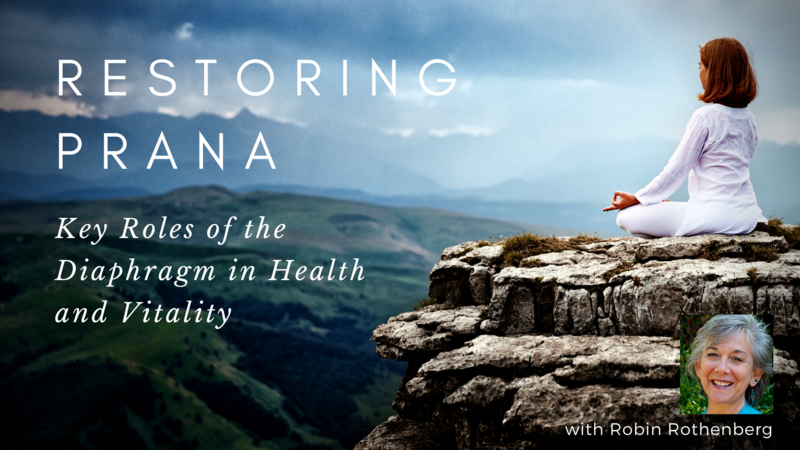 Restoring Prana: Key Roles of the Diaphragm in Health and Vitality.